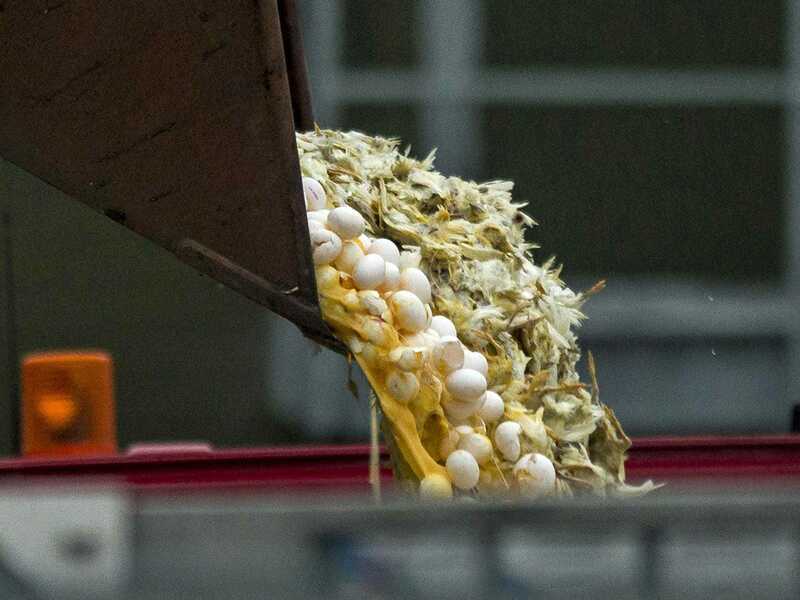 REUTERS/Marco De SwartA digger is used to dump eggs and chickens into a container at a poultry farm, where a highly contagious strain of bird flu was found by Dutch authorities, in Hekendorp November 17, 2014. 1. Japanese Prime Minister Shinzo Abe is expected to call a snap election on Tuesday, one day after poor GDP figures showed that the country had slipped into a surprise recession. 2. A Sierra Leone doctor infected with Ebola while working in his home country died Monday at a US hospital. 3. Mali has tightened security at its borders over fears of Ebola spreading from neighbouring Guinea. 4. The Australian Bureau of Meteorology upgraded the chances of El Nino developing to 70% as the tropical Pacific Ocean shows signs of warming. 5. Hong Kong authorities have started dismantling barricades located at a main pro-democracy protest camp opposite government headquarters. 6. 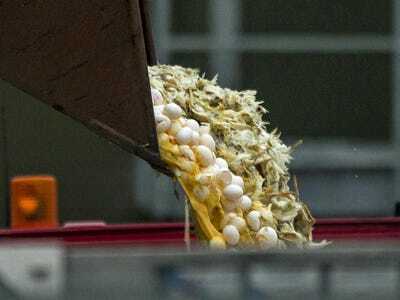 The European Commission has banned sales of poultry products in areas in the UK and the Netherlands where new cases of bird flu were reported. 7. An Uber executive has reportedly suggested digging up dirt on its critics in the media. 8. Japan cut its target of Antarctic whales killed for research by two-thirds, down to a cap of 333 from around 900. 9. Two terrorists who entered a synagogue in Jerusalem and opened fire, wounding seven worshippers, were shot dead by police. 10. Toyota plans to introduce the first commercially available car that runs on hydrogen in the US next year, a four-person sedan called Mirari. Thirty years after Band Aid released the hit single “Do They Know It’s Christmas?” to raise money for famine relief in Ethiopia, the song has been recorded again to help in the fight against Ebola in West Africa.